Applying textures to OBJ model? 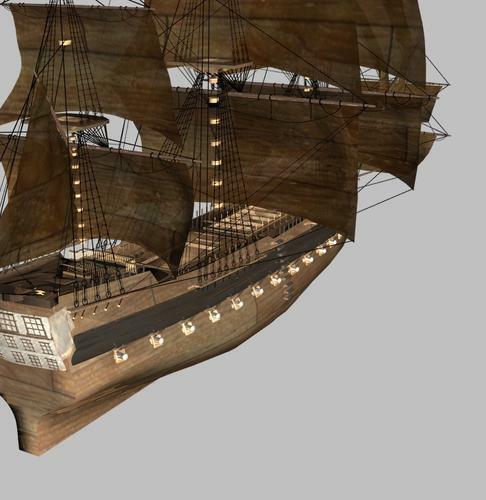 I recently downloaded a model of a galleon, an OBJ file. I can import it into DS and increase the scale and so on, but there are no textures. So I tried adding some, picking the material zone and clicking on the little arrow in Diffuse Colour and selecting a texture JPG. But all I get is a flat colour, whatever texture I choose, be it wood, stone or whatever. But I've used these textures on other props and they've worked fine, but don't work on OBJ objects it seems. Any way to do so? 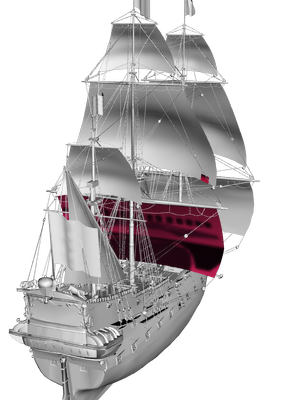 They do work on OBJ models in DS. The only thing I can think of, is that the model does not have UV Mapping. Go to the Camera tab, change to UV View, then select the object in the Scene tab, AND in the Surfaces tab, and you should see the UV Map if there is one. There is also a free version of UV Mapper as well, that would show you is the itme is UV Mapped. If you can select material zones, then you should be able to at least apply a Shader, have you tried that. Can you give a link to the model as well? Well, my computer didn't seem to like that! I went into UV mode and all that I got on my screen was a big white square, I have no idea if that's supposed to happen or not. I selected the model and went into surface to see all options (diffuse, opacity and so on) had vanished. Then DS crashed and went off my screen all together. I tried it again, same result, but no crash this time. I haven't tried using a shader, in fact as far as I know I've never used shaders. I'll go further and say that I don't even know what they are. After all this time, I'm still a novice! You wont see anything in the UV View unless you have the model selected in the Scene tab AND a surface selected in the Surfaces tab. Shaders are easy enough to work with, and I can explain how to do that for you. I am grabbing the model now, and I will get back to you in a few minutes. It is quite a large model, about 430,000 polys, but it is not UV Mapped. The materials will all apply to the material zones in the Surfaces tab, but without UV Mapping, they wont work properly. Shaders will work really well on this I think, I have done a few of the surfaces with some shaders that I have, but they are not ideal. The wood is done with a flooring shader. Use the Surface Selection Tool to slect the area that you want to apply the shader to, make sure that the model is selected in the Scene tab, AND when you click on the surface, it will be selected in the Surfaces tab. Double click on the Shader to apply it, and then render. You wont see the effect of the shader until you rendere with 3Delight. 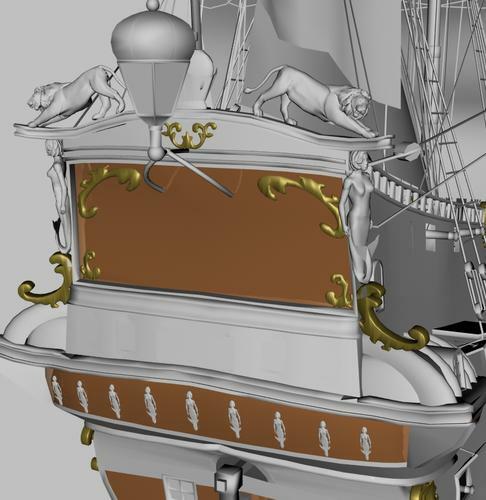 Its a nicely detailed model but it looks like the mapping didn't survive it conversions from Lightwave, through Bryce and into DS. (...and it also got triangulated at some time). I think JimmyC's suggestion of shaders is your easiest option, but try taking it into Bryce or Hexagon and see if they read the materials file properly. At least you might get the basic colours and perhaps you can "bridge" into DS from there, though I haven't tried that. Does anyone know if Hexagon can do Un-Triangulation? No, it can do the opposite. triangulate quads and ngons. It is a nice model, but very poly heavy because of the tris. Thanks for your replies, guys. Sadly just loading this model seems to be causing problems, I think the sad truth is that my old computer is running DS on the bare minimum requirements, and is struggling at the best of times. It's crashed four or five times while messing with this model. Which is a shame because it really is a good model, and just what I was looking for. I might be able to use this with some basic colours and stick it in the background. I'm not going for photorealism, anyway. I'm going to the freebie request thread and see if there's a more basic/less poly model or prop anywhere. I've got some smaller boats but no big ones like this. Again, thanks for your time, and i hope you get some use from the ship! It is a Bryce model, and I loaded it in Bry 7 Pro, and sent it to DAZ Studio. It took a while to come across, but when tendering, it was optimising images for ages, 191 different materials. I have the 64 bit version on Win 7, 16 BG, and it was pushing my resources. I doubt if it would work on older systems. Just a thought. Blender can convert tris to quads.